Material: Polyester/DacronWidth: Less than 45"
Base cloth: 100% chemical fiber. - Good reflective per f ormance, excellent warning effect. C olor: grey. Pleas e allow 1-3 cm discrep ancy due to manual cutting. Product Certification: produc t pa ssed EN471 2003, ANSI 2004, H.R4040, SVHC stand ards. The high refractive index glas s beads are coated on the surface of the cloth. so that ordinary cloth can reflect light under the illumination. Thickness: 0.25 mm. Color: grey. P roduct Certification: the product pa ssed the EN471 2003, AN SI 2004 standard. Would make beautiful underwear or lingerie. Red stretch lace with rose design with scalloped edge. Roses are highlighted by areas of more shiny finished lace which gives subtle effect. Variety of decorative projects including craft, sewing, lingerie. 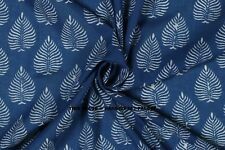 Material: JerseyWidth: Less than 45"
Vintage fabric remnant 47x43cm. Condition is Used. Dispatched with Royal Mail 2nd Class Large Letter. A selection of three pieces pieces of purple/blue patchwork weight fabric. Am having a clear out! The close up photos show the colours best on my screen. Colour: MulticolouredMaterial: 100% CottonWidth: Less than 45"
Vintage Cath Kidston rosali fabric remnant 53x37cm. Condition is Used. Dispatched with Royal Mail 2nd Class Large Letter. 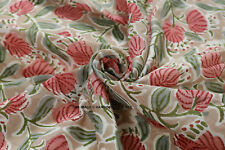 Material: Silk DupionWidth: Less than 45"
Vintage fabric remnant 65x57cm. Condition is Used. Dispatched with Royal Mail 2nd Class Large Letter. Colour: GreenMaterial: Polyester/DacronWidth: Less than 45"
Jersey Fabric, black & White zebra Funky Print remnant. 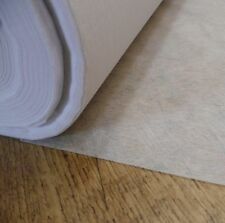 Ending 29 Apr at 8:02PM BST3d 6hColour: WhiteMaterial: JerseyWidth: Less than 45"
Vintage fabric remnant 51x45cm. Condition is Used. Dispatched with Royal Mail 2nd Class Large Letter. Colors - Natural Vegetable Dye. designs and patterns on fabric, by hand. What makes block Printing unique. It is carved onto the block by hand. The carved block is dipped into the. 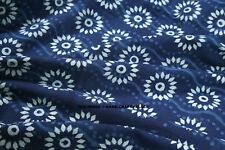 Item - 2.5 YardHand Block Printed Fabric. This fabric features beautiful starfish, octopus, turtles and so much more on a white background.Sold by the Fat Quarter. ♥ Height of pink octopus – approx 8.5cm. ♥ Suggestions for use – quilting, crafting and dressmaking. 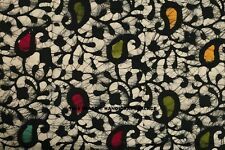 Colour: BlackMaterial: TaffetaWidth: Less than 45"
Designs and patterns on fabric, by hand. What makes block Printing unique. Pattern - Floral. It is carved onto the block by hand. The carved block is dipped into the. Cotton Thread count : 60 x 60. Colour: YellowMaterial: Silk DupionWidth: Less than 45"
Colour: YellowMaterial: Polyester/DacronWidth: Less than 45"